If you want an active career with many different pathways, get started at Douglas with a Diploma in Sport Science. In this 60-credit program, you'll take the first step toward a career in coaching, teaching, health and fitness, leisure and sport administration, or exercise science. Gain an expert understanding of exercise physiology, nutrition, biomechanics, motor learning, sport psychology, and more. Choose from specializations in Kinesiology, Health and Recreation, and Interdisciplinary Studies. For a detailed description of courses required for each specialization, please click here. Take classes at either the New Westminster or Coquitlam campus. 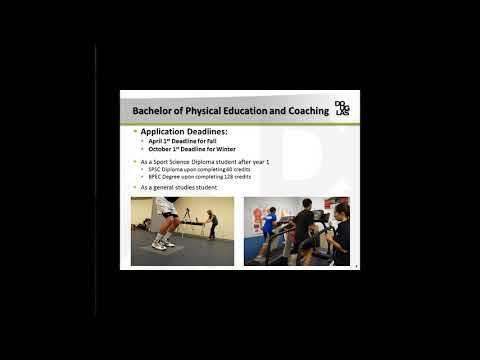 Begin the Bachelor of Physical Education and Coaching (BPEC) program in your second year and earn both your Sport Science Diploma and BPEC Degree. Transfer into the third year of BPEC and prepare for a career in PE teaching, kinesiology or coaching. *Check the BC Transfer Guide for options. For information on admission requirements, courses, intake dates and more, visit the Program and Course Catalogue. Be sure to check the Admissions tab as the Sport Science Department uses a preferential admissions procedure. Douglas College Sport Science is a department member of the American Kinesiology Association.